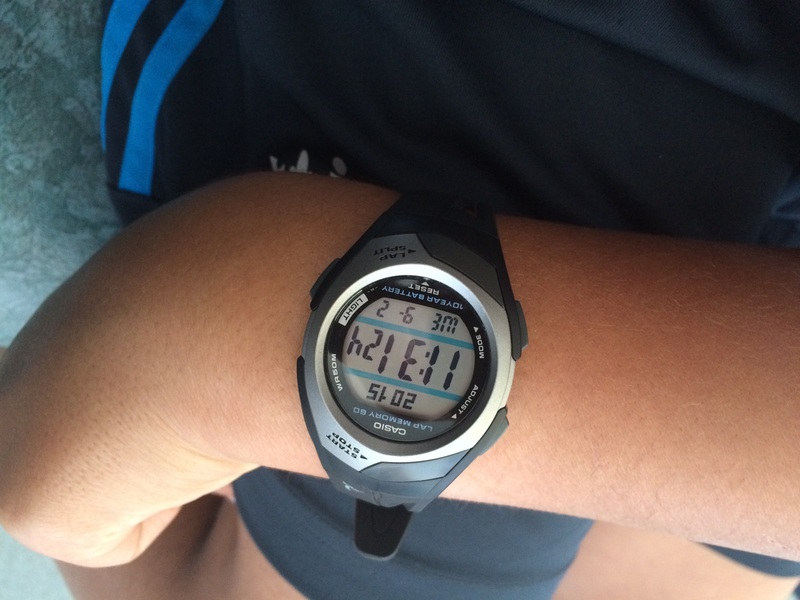 Perfect watch for my sporty son, who still has a habit of forgetting to take the watch off at times. The features are easy to use, and so far this watch is an extension of his arm. Excellent Watch, easy to use and looks amazing and as this was my first order with Watch shop I will say that the service they provide is second to none, really happy with the watch and the service, Excellent. Basic model but does the simple things well. I wouldnt be wearing it on a night out but its fine for the gym or a run provided you dont want to check your heart rate or need a GPS. Im happy with the purchase and the price was good. I bought this watch as a present for my nephew who is a teenager. I like the sporty style which particularly suits my nephew who loves to swim and is an active sportsperson. The price is highly competitive and I also saved about a third of the advertised price-thanks to the 5 pounds off voucher earned from my previous purchase and the points accumulated on account of the previous purchases. I got this delivered to the local Goldsmiths shop. The process was hassle free and I was given precise details of the delivery as always. Another great buy from Watchshop. I highly recommend the website. Good value watch with alarm and dual time. I bought this watch to replace my Timex Ironman which I had had over 10 years. All I wanted the watch for was when I go swimming to time each length. On first inspection of the new watch I was surprised how small the face is expecting it to be a bit bigger, the watch strap was just big enough for my left wrist, which is were I wear it for my right wrist it would not have fitted, the button for split time looked as though it could do with being on the other side but in practice it works fine where it is. The watch works well and no problems in the water. It is good having a view of both overall time plus the split time together and it is good to have 60 laps. The resetting back to zero I find an awkward fiddly process. Overall it does what I require of it. Easy shopping experience - speedy delivery and great communication ! This is the second of these watches I have bought. I love it and its not too expensive. I use it for running and every day use. Its light weight and comfortable with large digits for easy viewing. It has a sunken face, so is less prone to scratching. It has the usual stopwatch and lap functions but with two large flush buttons, top and bottom of the face, to stop and start. Changing the time can be fiddly but you get used to it. I particularly like the dual time feature when Im traveling in Europe. The battery has a 10 year life expectancy. Things I dont like about it. The strap only lasts about 3 years and costs about half the value of the watch to replace. I changed the strap the first time it broke but then bought a new watch after 6 years. Looks good, fits well, does what it says on the tin! Bought this for my children to count their swimming laps. Perfect size for teenagers or women. Its really good and the instruction book make it easy to use all functions even though we dont really need/ use all of them. The 10 years battery remains to be proved but its a bonus worse trying at that price. The children are very happy with it. Watch is fine and feels like a good quality product hope I am still saying this in 5years time! However the Instructions are overly complicated, in multiple languages and printed too small. Great watch. Fantastic and easy to use stopwatch function. Looks good and not too big. This watch was bought as a Christmas present and looks as good as on the site. The only downside for me was the packaging which was a thin cardboard box, and as a present was a little disappointing. 10yr battery, auto light function, big easy to press buttons, stopwatch, lap timer & 60 lap memory all for less than £20 is excellent. The only drawbacks I can see are that it is overall very small & the visible screen size is only 2cms across & the strap is very very thin. But as Im only going to use this for the lap/stopwatch function when Im running I dont really need the bulk of a divers watch which is my usual choice of watch style. I needed a basic watch for long distance running and this item had the features I required i.e. a simple stopwatch along with a split/lap time facility. Ive used it a couple of times already and find it very light and comfortable. The only slight criticism I would have is that the buttons on the front require to be pressed quite firmly but for the price I paid, I feel it has been an excellent purchase. Bought the watch for my husband so that he could use it for coaching session. Even though it did everything we wanted, the watch face was really small and difficult to read during night time training. I bought this watch for my 13 year old son, and I couldnt be happier - it is perfect size wise and function wise. I had been worried it would be too big but it fits just right on the arm 4th hole in the wristband in and importantly is not too chunky/fat. The time display is nice and big. And my son has already made use of all the settings...dual time zone, stopwatch/timer and alarms. So he is very happy. Great item, great price and great service being able to click and collect from Goldsmiths. I bought this watch to wear mainly as a day-to-day sort of watch when you dont really need to look smart, and also I never remember to adjust the date on my analogue watch at the end of the month, so always had to scrabble around for my phone to find the date, which was a pain. I liked it mainly because of the small size, I just dont get the recent fashion of HUGE watches, I think they look ridiculous and finding one that wasnt was a challenge. b on the home screen they dont do anything anyway. They only come into play for the stopwatch and adjust functions. One slight very slight disappointment is the light. It is of the old-fashioned little light-in-the-corner type rather than the blue glow type and only stays on for 1 second. I didnt realise you could even still get watches that didnt use the blue glow thing, I thought the actual little lights had been phased out, but there you go - every days a school day as my father used to say. All in all its a good little watch if. like me, you dont care enough about these things to spend much ~£19 and it does all of the things it is supposed to do perfectly well. 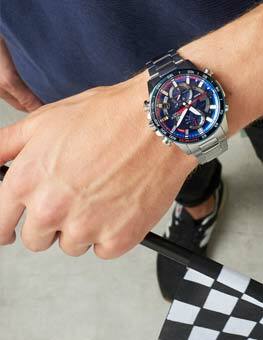 Its nice and light, so you will hardly notice youre wearing it and if youre a sporty sportster Im sure youll love being able to measure your sportiness to the millisecond, and having the watch remembering how sporty you are too. Oh and by the way, the speed of delivery from Watch Shop was really good. Ordered Friday afternoon and arrived on Saturday morning - cant say fairer than that can you? So good job watch shop, keep up the good work. Waterproof and with lap timer and countdown it covers most sporting needs. Nice clear face for everyday use. Ideal for my purposes. Not too big and easy to read. If the battery lasts as stated and the strap wears well I shall be very satisfied. Personally I found this watch a perfect size. Its very easy to set up and the glass is very hard scratched which is a very good thing due to my other watches getting ruined because of scratches. I would recommend this watch to other people mainly people who do sports because of its many functions. I was looking for a cheep watch to ware while Kayaking. The watch is just what I needed it is easy to read and also has a light. I is waterproof which was important to me and I am very happy with my purchase. Good value for money and easy to use. If I had to say anything negative, it would be that I might have preferred it to be a little bigger. Simple to use even when Im under training stress.Solid construction, light, affordable. Just the job. A superb watch as usual by Casio. Instructions very comprehensive but the print could have been bigger. watch was smaller than I expected which suited me because I only have thin wrists and chunky watches feel clumsy to wear. The product is really good and its characteristics. I`ve bought it because it`s similar to another one which I`ve lost recently. The colour is black, classic, and it`s really functuonal. It`s a good watch for running. Finally,I`d like to say that the service`s been excellent and really fast. I am really satisfied with this purchase. As well as an watch for keeping good time, as a Sports Watch, I use it as a stop watch for umpiring hockey matches and I can use it when I am coaching hockey. Light and easy to wear, plastic strap etc, I have used these Casio type of Sports Watches for the last 25 years or so. Looks great, cant wait for my grandson to open his birthday present. Good packaging excellent watch. This one has good directions for use. I have had the Casio for about 2 months, and wear it for every run, I am training for the London Marathon in April. It is an excellent watch and I particularly like the 10 year battery, the waterproofing and the fact that I can leave it into my sports bag after running. The good points are that it is inexpensive, very accurate, and holds 60 split times, more than I will ever need. It is very light on the wrist, easy to read and it is fairly simple to use the time and lap split functions, once you get the hang of it. I do not wear the watch except for running, the size is more like a ladies watch or a childs watch, although it does fit my large wrist comfortably on the third hole. The other functions on the watch are more complex that on my previous Casios and I dont consider them to be practical. If you want something more sophisticated or more stylish then I would advise you to look elsewhere. If you want a simple, inexpensive watch for running with split times then this is an excellent choice. Thanks to Casio and to Watch Shop. The watch was a good fit and comfortable to wear. Simple design with not too many buttons sports watch. Display was clear to read. Most importantly the watch looked good and was fit for purpose. I needed a light and water resistant watch with easy to read display: the Casio Phys Sports Alarm Chronograph fits the bill perfectly! I liked the look of the watch and the sale price was excellent! 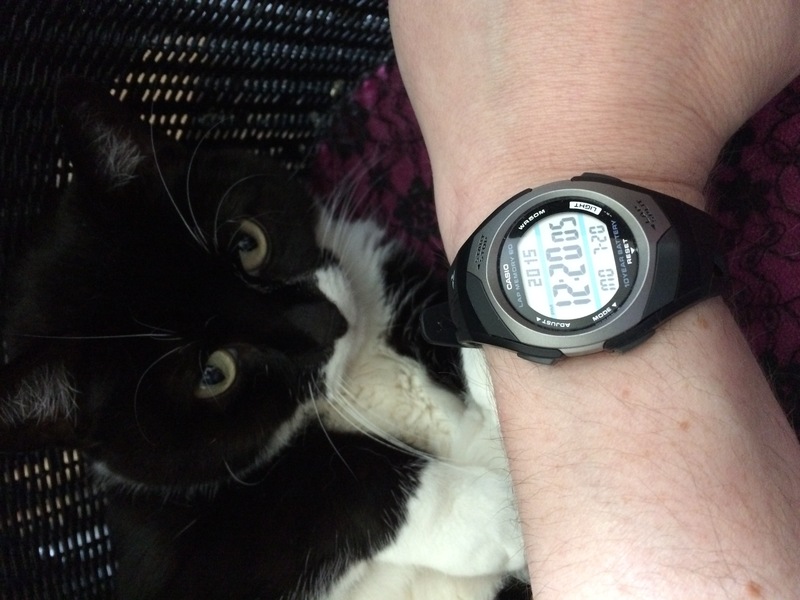 I made comparisons with other digital watches but this one ticked all the right boxes! There is a lot I like about this watch, but a few things I dont. I like its design, its size, its clarity. Some other reviewers say that it is small - l disagree. It is a good size, with a very clear time display, and surely the very clear time display means that this watch is fulfilling its primary function. I like the light which allows me to read the time easily in difficult conditions, and at night if I wake up. I like the day/date functions. Although I like the ability to set 5 alarms, I wish there was the ability to set them for weekdays only - my other half gives me loads of grief if an alarm goes off at the weekend when she wants to her rare lie-in. And I regularly fail to cancel them on a Friday night. I dont use the sports functionality at all, so cannot comment on it. My biggest bugbear with this watch and the somewhat similar SPS-300C-2VER is the price and the strap. The watch normally costs about £20, and a replacement strap is £11 or so. I find the strap lasts only 2 years or a bit more, and then I buy a new watch reluctantly, because replacing the strap is very difficult I end up taking it to a jewellers because I cant do it myself and ultimately full replacement is more satisfying and economical. So, thanks Casio for a great product, but you should design a similar watch with just the time, date, light, and alarm capability, and a fabulous easily replaceable strap, preferably at a £15 price. I hadnt seen this watch in a store before ordering so I was worried it may be a little bulky like many other sports watches. I neednt have worried, the watch looked even nicer in person-very sleek looking and doesnt look cheap. I bought this for my boyfriend to wear to work but I would even consider wearing something like this to the gym etc as its not too chunky or overly masculine! The buttons are easy to press which would be good for sports but may not be so good for daily wear as they can press too easily by accident. Also the strap looks very nice and sleek but doesnt seem like it could be replaced if it were to break the plastic on the strap is a bit more thick/stiff than some it have seen. However it is not too expensive so this isnt a major worry. Overall a good purchase and I would recommend this watch. I bought this watch as a present for my cyclist hubby. 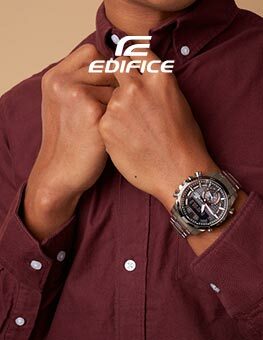 He chose this watch because of the features he wanted eg stopwatch, lap memory, lap split and water resistant. The light is an essential feature for him too. 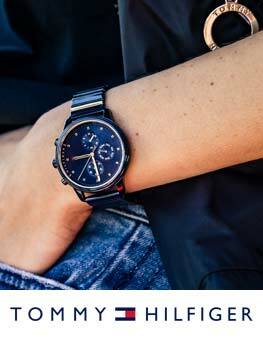 The watch is lightweight and versatile. Just what was required. Stylish, waterproof and features that are easy to use. Excellent price too. Im really happy with my purchase. Pretty much what I expected its a smallish light watch with all the functions I need, adequately waterproof, acceptable appearance and hopefully a long life from the battery. I hope the strap wears well. Good product, excellent night light and good value, always bought casio watches never any problems. This was a self purchase to have a stop watch as another watch failed to work! This is a standard watch with nothing exciting about it but does the job! The product is excellent. Good fit on the wrist and not too big just the perfect size really. This is the second one of these I have had, and it is great for keeping records of runs. The only thing I find that doesnt work that well is the distance measurement but Im old school and use a map. Its light to wear- you dont know its there unlike the smartphone on your arm, has easy to use buttons with gloves, and its waterproof. The battery lasted years on my old one. I bought this as I used to own a Casio watch with a pacer signal years ago and found it really good for running. Be warned though that the pacer on this watch is not constant. It sounds for the first 30 seconds and then wont sound again unless you press a button and then again it only sounds for 30 seconds. Getting your stride length right also takes a bit of trial and error unless you run on tracks. I know the length of my normal run circuit and Ive varied the stride to reflect that. He watch is very light, well made and has a lot of good functions. Good but has some minor drawbacks as above. The Men’s Casio Phys Sports Alarm Chronograph Watch STR-300C-1VER was a pleasant surprise, all the dials and buttons work perfectly, the fit was very comfortable on my wrist, and I’m using all the gadgets to good use. Stop watch an lap split buttons are big but need to be pressed in a specific spot so features can be difficult to use when out on a run. Stop watch and count down feature can be start at start of run and stopped at end which make for a basic an simple running watch. I bought this watch for running on the basis of previous reviews, mainly because of the lap and timer memory and the multi-screen. So far I have been very pleased with it: affordable though I havent seen it anywhere at the so called full price, light-weight, and relatively small. For me with narrow wrists it fits over running clothing, ideal as winter approaches. Very large wrists may struggle. The timer memory is proving useful, keeping a track of my runs, though this will fill up relatively quickly. Deleting entries is relatively simple but takes a little getting used to. The big screen with three sections is very good. A stand-out feature in the stop-watch is having both the split and the total time running concurrently. Even better, you can choose which one is the larger on the screen. The casing edges are raised around the transparent part of the watch protecting it somewhat from knocks and scratches. As others have said the side buttons are quite light touch and the start-stop require a firm press towards the centre of the watch. The latter is probably a good thing so I dont accidentally start/stop or lap. I havent used the alarms or the pacer or the world time, though my children quite like the idea that my new watch also tells the time in Australia. It is not beautiful not really for going out in - but then, for a sports watch, it is far from ugly either. Great little watch, does exactly what I need- basic but useful functions. For the price, you cant go wrong! Delivery was also very prompt. great little watch, lightweight and easy to use, Cheap but good enough for running marathons and cycling. Excellent little watch for running. Basic functions such as stopwatch and countdown timer but the best thing is the 60 lap memory so you can record your laps if doing an interval session. Not as good or expected to be as a fully functional GPS watch but if all you want to do is record your laps without too much fuss or wear it casually, then would not hesitate in recommending it. Excellent present for my sports mad son. Good value - packaged exactly as in shops but cheaper! I purchased this watch for my father as it has up to 5 different alarm time settings. The watch look nice especially for the price. It was just a much smaller face than i expected, more suitable for boys rather than a man. Still keeping it though as it was more of a purchase for the functional aspects rather than the looks. Excellent watch, brought it for my brother, he loves it and will be wearing it whenever hes out running! Great watch for the price, absolutely packed with features youd expect from a much more expensive item. Real quality item too, would recommend to any runner. Love the watch, matched the description and pictures although smaller than I thought. Postageand delivery was very fast indeed. Great watch, good features, easy to use, just the right size. Good that it stores all the times from 60 laps or 60 runs. Hoping the 10 year battery lasts. Cannot be beaten as a simple runners watch - it does everything you need with 50 lap memory and countdown timer. Reliable and very easy to use good size buttons. Light weight - do not feel weight on my slender wrist when running robust easy to operate - stop watch has separate stop and reset buttons which has proved invaluable when timing mountain walking navigation legs with rest breaks part way through. Bought as replacement for the same model which served me well until eventually after many years use the strap split. I would certainly recommend it to anyone, and would buy it again. Just what I was looking for - a neat, compact digital watch, with a clear display of the essential information without all the unnecessary fancy graphics. I use the lap timer to retain separate run times and the alarm to get up in the morning. I havent used the pace timer yet as my usual route doesnt lend itself to a steady pace. I have had digitals before but they were too big for running with - this one is smaller than most and has simple clean lines, which suit me admirably for normal use as well as for running. I have had one of these watches before so i knew what i was getting, i like the way the watch feels on my wrist or should i say the lack of it in terms of weight, I like the size, big enough to see the display but not to big that you are constantly reminded that you have a timepiece on your wrist.The watch feels right, the strap is flexible, the buttons are easy to operate even with running gloves on. I like the different sounding bleeps that tell you that you have started the stop watch function or stopped it and its a seperate button on top of the watch which means that you can use it in the dark. The backlight is bright enough for you to see the display, It has a 60 lap memory or 60 runs in my case so i can log my runs over a month without having to delete the time after every run.The timer is a usefull function as well, but i have not put the alarm to the test but i am sure that it would be up to the task. The other points that i like is that the watch has a 10 year battery life which is ample and the 50 meter water resistance copes well with the British weather and the compulsory showers after my x-country runs. And its a Casio so you know that the timepiece is well made for the price, regardless of what country it was assembled in China in my example. Lastly would i say to others that this watch is worth buying, well i believe so, it does exactly what it says on the tin if you know what i mean, buy one and try one i am sure that you would not be dissappointed. Now been using it for a few weeks and Im very happy with it. Feels a bit flimsy but works a treat, I can hold is strapped around my hand and easily hit the top start/stop button when running 150m timed reps on the track...which was just what I wanted it for. Havent used the other functions but they look like theres more than I need! The watch is slightly smaller than I thought it would be, but thats fine as my wrists are not big. It has even more functionality than I will use and is good looking. For the price this was an excellent buy. Good Watch for runners. I use it every times I run. Easy to take lap time every lap. Good alarm uses it every day. Excellent multi-purpose watch. I use its stop watch function which is great for timing runs. The face lights up at night so that is very helpful. Easy to use and great value fo money. Cheap runners watch with lap function. If you just started running and you dont need to monitor your heart rate and such, this is the watch for you! A little small, but looks and feels great and the digits are very easy to read. I have only had this product a week, but so far I am very pleased. A simple compact, efficient stopwatch with all essential features needed for my desired use, running. Seems like a good watch, have only used it once to date, but seems to do what it says on the tin. The buttons seem easily reachable, even during sports itself. I like the fact that it's not big, it's probably about the same size as the Ironman I had before. I bought this foil shaver to replace an old and trusty Remington M3000 which had worn out after many years of service. This one is very similar but has the addition of a countdown timer for battery charge remaining which is very useful. It also has a pivoting head which follows the contours of the face which I find gives a closer shave. The retractable trimmer for the removal of longer hairs is also very effective. Overall this is a great shaver for a fast and smooth shave. Excellent running watch for the price. Cheapest on the net by far! Speedy and cheap delivery, will defo be using the site again soon! Nice watch, bought this for my running sessions, as I do a lot of laps and wanted to be able to see my lap times. It doesn't look sturdy, but I got a G-Shock for rough times. This one is just a simple running watch or daily watch. Big numbers on the screen, good green led light. Would definitely recommend this. Got it for my father on his birthday - he's very happy!!!!!!!!!!!!!!!!!!!!!!!!!!!!!!!!!!!!!!! This is a basic, cheap watch but it looks good and is perfectly functional. I am a runner and wear glasses so I wanted a watch that was not too busy and had a clear display that I could see "on the run". This watch fits the bill and I am very pleased with the purchase. I was a little disappointed that the bezel on this watch is actually matt silver plastic, not bright metal as I had imagined it, but it is still a very smart watch. it was a present for my 11 year-old grandson - his first grown-up watch, and he declared it "really cool" and it took him no time at all to learn all the functions. He is looking forward to timing his swimming laps and scuba diving times. If he treats it well and it survives we will buy him a more expensive Casio model in a year or so. A nice light little watch. Standard Casio face with lots of other gimmicks that I probably wont be using. Makes a change from wearing a heavier strap or link bracelet. Makes me feel quite young. Value for money, a simple watch, ideal for runners. Could be a little easier to use some functions, perhaps i should read the instructions first!!!!! The web site was user friendly and therefore easy to identitfy the item required at the affordable price. Exactly what i wanted in that the dual display of the splits & laps is perfect. The pacer function is a little bit stupid, not really my kind of thing. This watch is excellant value for money. I bought this for my partner for him to use whilst running. Nice stylish shape and easy to use. We are very pleased to own the new Casio watch from Watchshopuk. We ordered it freday and recieved it monday, so no complains at all. I can only recommend Watchshop. Service was excellent-the watch arrived the next day. The watch was not so good-smaller than I thought and complex to use with buttons which did not always register. Now consigned to bottom drawer. Likes: The look an comfort are very good,all the buttons are easy accessable and respond easy to touch. All the functions are easy to acces. Dislikes: Count-down function can ony be set in 1min periods and cannot be set to anything under 1min. The distance function uses the the 'paces per min x pace length' for it calcuation( ok if you run on a flat surface mile after mile). During a training session you are unable to view the distance already traveled and have to wait until it been recorded. Overall the watch has helped me to keep accurate track of my lap times for running, it is slightly smaller than I imagined but after using it once I found this not to be a problem. The watch is very easy to use, the only thing that takes a little time to get used to is the lap/split buttons, but I understand they have to have a little extra resistance so that they are not set of accidentaly. Watch does all I wanted, at a reasonable price. I have always been a fan of Casio watches and this one is very good. My only quibble is that the buttons are a little difficult to press while running although I am getting used to it. This sports watch was bought as a present for my partner, it was just what he wanted and he was realy happy with it! Has all the options for a runner, doesn't leak in rain or sweat, great value. It is exactly what i'm a looking for!!!! Great watch, really light and suits perfectly for sport, especially for running!!! Nice combination of price, quality, technology and design!! As a marathon runner I've used a number of sports watches over the years - this watch is by far the best. (It's a replacement for the same model so I have several years experience of the watch. )It is an excellent everyday watch with good alarms, etc., but it really comes into its own as a sports watch: the combination of 60 lap memory for a single event, a 61 event log memory, a countdown timer,and pace signal in a watch at this price is unbeatable. (I've not used the distance measurement function which is a new addition to this model, but it is not likely to be as accurate as GSP watches.) I have used it while swimming and surfing many times with no problems. 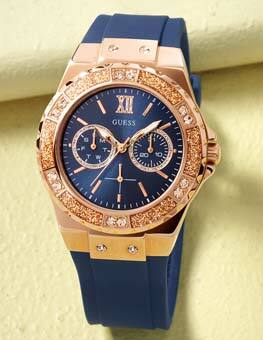 Overall a great package at a great price, with matching excellent service by Watch Shop. Well this watch does exactly what it says on the box. It has a nice and clear display (with a Backlight) and is very easy to use. 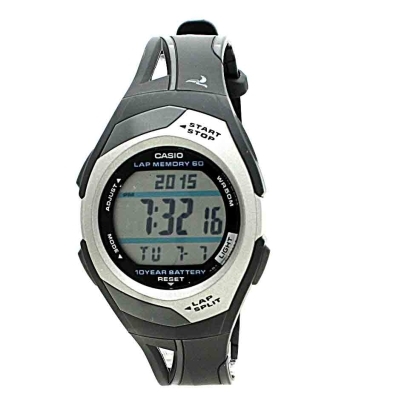 The Casio is lightweight and follows standard chronograph layout, allowing a Stopwatch (the main reason I brought the watch), Dual time, Countdown timer & Alarm. An extra on this watch is to allow you to set a Pacer value in the Stopwatch mode, where the watch will 'beep' and you should then stride. The watch will then work out the distance you have run. This will however only work if you are continuously running and would be perfect for track running. The Start/Stop and Lap/Split buttons are a little difficult to press, however there is an audiable beep (which is very usefully different for Start & Stop on the Stopwatch). 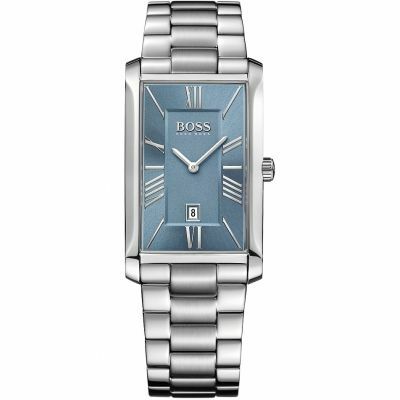 I purchased this watch for refereeing and it seems to be a perfect second watch (Apart from the loud beeps may cause me a problem in matches, but im sure I will get around that). If you could 'mute' these beeps, the watch would be perfect. Overall, a sleak and simple design providing everything you would need in a Sports Chronograph Watch for a excellent price. I ordered this watch as i had had the same model previously which is excellant value for money and a good sports watch due to the stop / lap time feature. I have to say that the sevice given by WATCHSHOP UK and the attention to detail and keeping you informed of the processing of your order by e-mail is second to none,i would not hesitate to purchase items from them again. a excellant company to deal with. I bought this watch as I wanted to record split times at certain points on my training runs and as I sometimes fahtlek train a record of lap times would be a useful feature. This watch has both and what I really like is it shows them both on screen at the same time when the Lap/Split button is pressed and when in recall mode. The display is really clear and it's very simple to use. The watch is also quite compact and lightweight. My only gripe is the Start/Stop and Lap/Split buttons seem a little temperamental and require a firm hand but an audible beep accompanies a successful press I so this isn't really that big a draw back. I would definitely recommend this watch.